Many years of cooperation with international motorcycle companies make FISEM one of the most valued manufactures of seats in Italy. 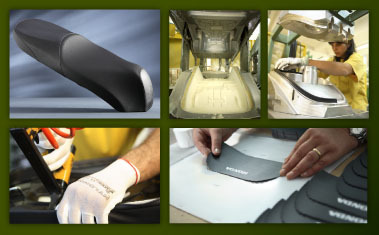 FISEM is able to handle seat projects from the very first development steps to industrialization and production, thanks to its great flexibility and ability to meet the customer's needs. The motorcycle production line is placed in a proper area and the manufacturing process is aimed to reach high quality and competitive results. The different assembly lines are made up by modern polyurethane molding machines, CNC machines for cutting operations, and ultrasound welding machines. Moreover accurate raw material selection, experienced staff and constant inspections on the production process warrant high quality items and on time delivery for the different types of seats produced.